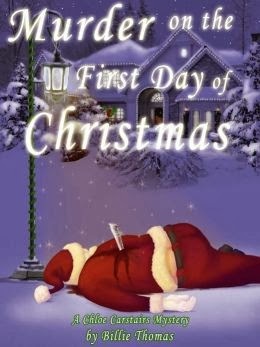 Intrigued by the cover photo of Billie Thomas’ Murder on the First Day of Christmas, a photo of poor Santa lying face down in the snow with a Lucite icicle to the back, and then learning this book won a Shirley You Jest! Shirley HAH Award for fiction, I gathered my post-it notes, highlighter, and pen before turning pages. Starting life as Lady Marmalade, the discovery of an un-dropped testicle had resulted in one of the few documented cases of canine sexual reassignment and his name change to Lady Chablis, as in the drag queen from Midnight in the Garden of Good and Evil. Besides bringing such life to a canine, a key player in this mystery, my heart went pitter pat at Thomas’ use of allusion above and in reference later to the movie, It’s a Wonderful Life. Besides the phenomenal second-order writing, the plot, a mystery involving three murders left me clueless until the protagonist, Chloe Carstairs and her mother solved it for me. A fan of Thomas’ manipulation of language for the purposes of decription, my inner grey hair pulled taut into a bun English teacher reeled at the occasional spelling errors and repetition of lines in this piece of writing. Revise, revise, revise . . .. Okay, I am feeling better now that that has been discussed. For the purposes of book club, Scotch and chocolates are out of the question for health reasons, of course. However, readers cannot resist lobster puffs, crab cakes, wasabi-dressed asparagus, and Gruyere quiches in order to spark conversation about Saul’s Christmas party, where the mystery begins.